Last Thursday, Los Angeles audiences were treated to a very special engagement of the new play, “The Curious Incident of the Dog in the Night-Time”. The insightful new play, based on the novel by Mark Haddon, is written by Simon Stephens, who coincidentally has another play, “Heisenberg”, running next door in the Mark Taper Forum. “Curious Incident” tells the story of Christopher Boone, a 15-year-old boy that describes himself as a “mathematician with behavioral difficulties”. Though it is not clearly stated what Christopher’s disorder is, it is implied that he resides somewhere on the autism spectrum. The play begins with Christopher discovering his neighbor’s dog, Wellington, impaled by a pitchfork. After initially receiving the blame for the murder, Christopher takes it upon himself to seek out Wellington’s true killer. Along the way, Christopher unexpectedly finds more hidden truths about himself. And his family that he may or may not be ready for. Adam Langdon gives a remarkable, seamless performance as Christopher; so much so that you feel that he IS this poor boy searching for answers. The rest of the cast down to the ensemble players are all wonderful as well, with each actor playing an integral part to Christopher’s story. The fantastic lighting design by Paule Constable and incredible scenery by Bunny Christie also completely engage us making us feel as though we are taking the journey with Christopher rather than watching him from afar. 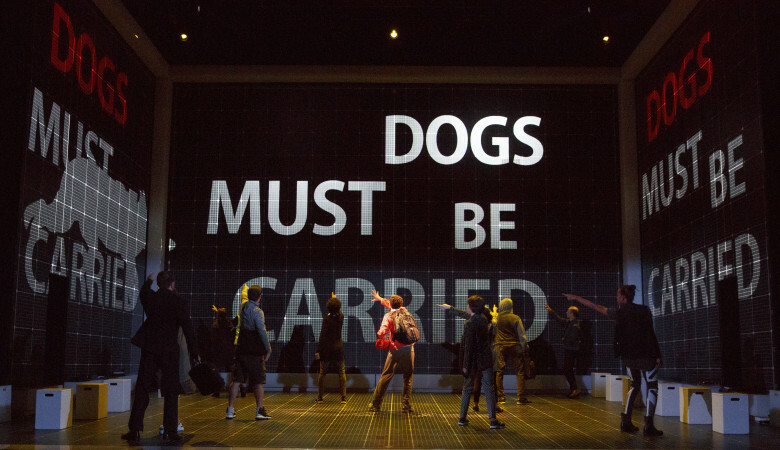 “The Curious Incident of the Dog in the Night-Time” is a mind-bending theatrical feat that is not to be missed. Tickets can be purchased at www.centertheatregroup.org.